E.L.S. Landscaping can also offer an option which represents another recent trend in outdoor spaces: creation of an outdoor kitchen. 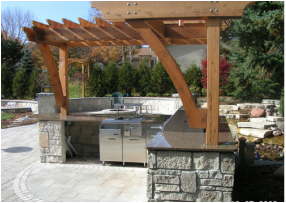 Whether planned as part of a new deck or patio or built off an existing patio, an outdoor kitchen makes using an outdoor space for entertaining and dining much easier. Outdoor kitchens typically include a grill and stainless-steel sink, storage space and a built-in refrigerator. Appliances are installed in a stone or brick base with tops of weather-resistant material to provide work space. ​Firepits or fireplaces provide a casual focal point in a yard or on a patio. Built of brick or stone, a firepit or fireplace offers a cozy gathering space outdoors and helps make a patio usable longer into the fall season.